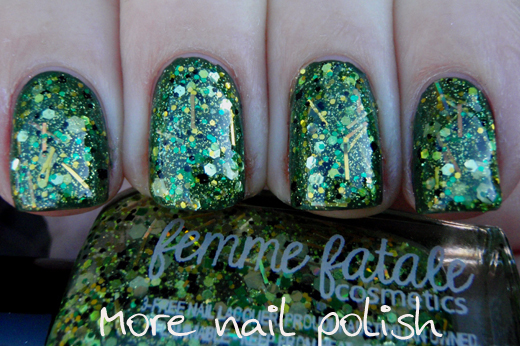 I'm excited to show you three polishes today from Aussie indie brand Femme Fatale. 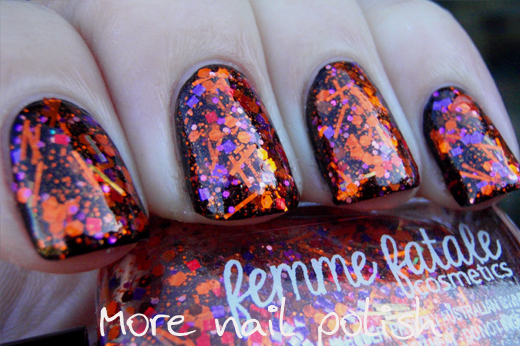 These three polishes make up their Halloween trio, and each one is pretty stunning. 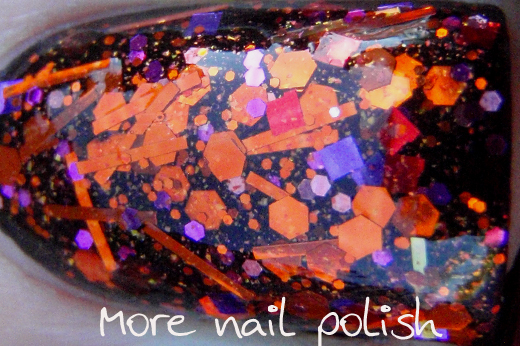 Tricky Treat is a tinted orange based with mainly orange hexes and bars. It also has a scattering of pink hexes, holo pink hexes, red and purple squares, red hearts (there is one on my pinky) and a pretty fine copper shimmer. 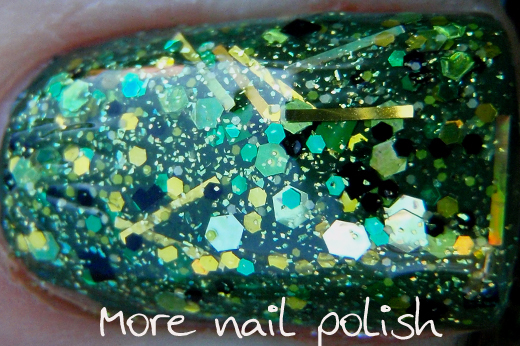 This polish is packed with glitter, but it's not dry or too difficult to apply. Because of the bar glitters you will need to wiggle the brush a bit and use a dabble method, but the effort is completely worth it. Here I have layered one coat of Tricky Treat over a black base. 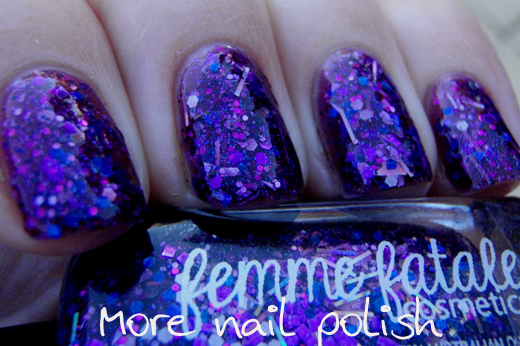 Topped with glitter tamer and Seche Vite. 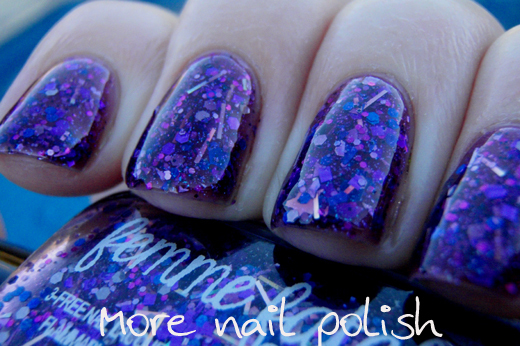 Sinister Calling is a gorgeous purple glitter polish in a purple jelly base. 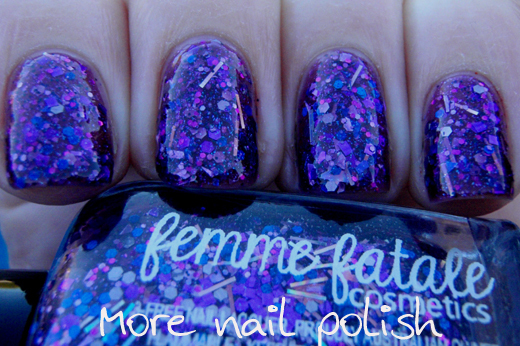 This one is also packed full of glitters, and here is the full glitter description from the Femme Fatale site. 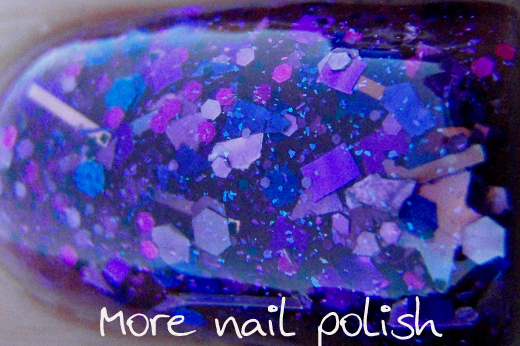 Holo purple shreds, navy blue shreds and hexes, holo silver bars and stars, colour-shifting shimmer (blue>purple), tiny deep blue glitter and various purple glitter in different shapes/sizes. WOW. Because the base in this is well tinted, I was able to build up opacity at three coats. This is three coats with Ulta3 non-chip and Seche Vite. There are bar glitter in this one too, so you might need a little practice in getting them spread out, but they certainly remain smooth and flat, no curlies here. Ghoulish Glee. This one is my favourite of the bunch. I just love it. The base in this is tinted green, and would probably build up to opacity at three coats, but his time I decided to layer it. 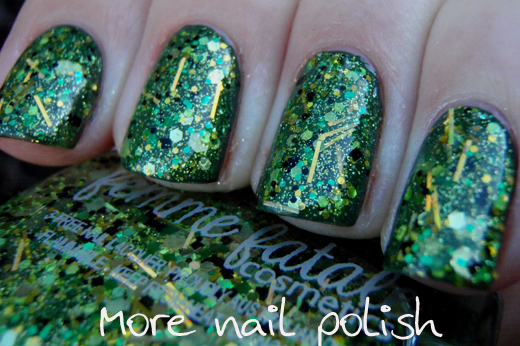 The glitter description from the FF website details this as: a complex glitter with many different types – holo gold bars, holo lime hexes, black squares, moss green hexes, light green hexes, green squares in metallic/matte, tiny neon yellow and chartreuse glitters – and more! Here I'm wearing just one coat of Ghoulish Glee, layered over RBL Orbis Non Sufficit. 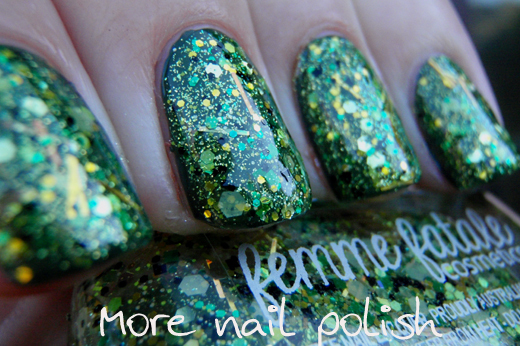 Arrggghhh *wipes drool from corner of mouth* Topped with glitter tamer and Seche Vite. I'm sure you can see the bar glitters, so you know the deal with application, but again everything is perfectly flat. 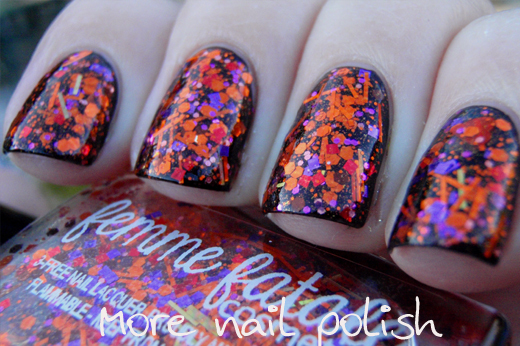 It's bright and shiny, and full of so many complementary glitters, it's dreamy! You can grab 5ml mini bottles for $4 each and full sized bottles are $10.50. 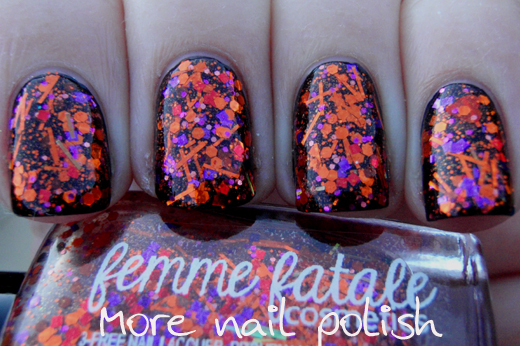 Femme Fatale only ships to Australia at the moment. So international gals, if you like these you need to make an Aussie friend - STAT! Ooohh, I bought Sinister Calling and Tricky Treat the other day but now I'm thinking I may have to go back and get Ghoulish Glee - it looks awesome! These look amazing! Tricky Treat is my favourite! Unfortunately, I live in the States, so these are not an option for me. Normally I am not a huge fan of purple, but there is something about Sinister Calling that speaks to me. Lovely swatches! I feel bad they don't sell them here. WOW! They are all awesome! Hey, do you still sell the color morphing pigments? I know you don't do the Spectraflair anymore but I'm looking for a certain teal/green/purple one that someone got from you. Gorgeous! If anyone is looking for an Aussie friend, I'm here :) I'm looking for someone in the US to help me get some polishes!